The agenda portion of My Perfect Planner is designed to make you life simple. Entering appointments is easy as 123. Alarms are also available. To register an appointment, point to the time slot you want and click. A small window will open where you indicate whom the appointment is with. Choose an individual from the drop down Name list or begin typing the name. If the individual is not in your contact list, you will be alerted that they have been added. You can visit the Contact screen by double clicking on a person's name. Slide your mouse over the image to see the list. When you tap the key you are moved to the " Reason" column. Here you may enter a description, and you may change the date and time. This field is optional. Confirm the date and time. If this is a daily or weekly repeat appointment, put a checkmark under the appropriate option, and enter the number of times the appointment/task should be repeated. When done, choose the Close button. You will be returned to the Daily Schedule. 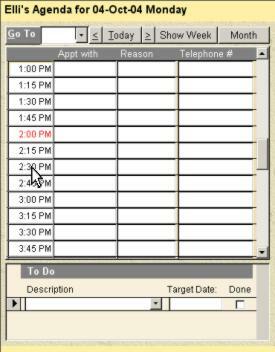 If the appointment/task is more complicated, choose the 'Other' Button. Change the Start Date and Time (if necessary), enter a Finish Date, and finally choose the days of the week this appointment has to cover. 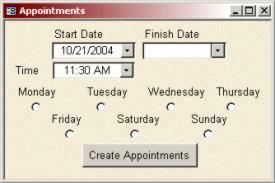 When done, choose the 'Create Appointments' button. You will be returned to the Daily Schedule. The Show Week button will open a visual of your week's activities. The 'Month' button will open a paper copy of your month. The agenda section is part of a greater program called My Perfect Planner.